Oakland Councilmember-at-large Rebecca Kaplan hosted a community meeting on homeless solutions Monday to address what she believes is the city’s number one concern: the number of unhoused people living on Oakland’s streets. According to Kaplan, the meeting was about honing in on all possible solutions to end the community’s ever-growing homelessness crisis. She believes there hasn’t been a response in line with the magnitude of the problem. Kaplan began by greeting the more than 80 people in attendance and thanking them for taking a first step to fight the city’s mounting problem. “Tonight, we are having a community conversation on real strategies,” she said. “The number of unhoused people has gone up dramatically in recent years.” In her memo to the city, which was publicly noticed by the City Clerk’s office on March 2, Kaplan stated that the number of homeless people has risen from 2,191 to 2,761 between 2015 and 2017. 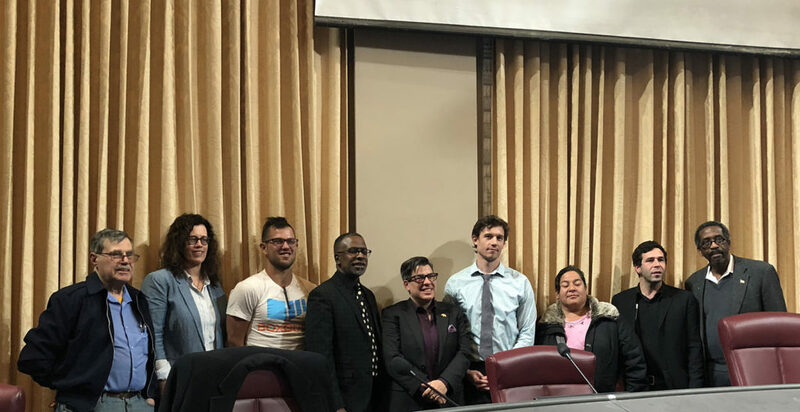 The meeting, which was held in Oakland City Hall’s council chamber, featured a panel of local activists, faith-based leaders and leaders from other community groups including EveryOne Home and The Village, all of whom introduced different strategies. Elaine De Coligny, executive director of EveryOne Home, reminded attendees of the roots of the problem: Oakland’s rising inequalities in terms of wages, sky-rocketing rents and a severe dearth of housing units. Her organization’s solution is to focus on prevention; for example, they propose an increase in the availability of Alameda county’s flexible funds—funds created to alleviate homelessness—specifically for those at risk of homelessness, including couch surfers, people already dependent on permanent supportive housing and those who have been homeless before. Kaplan nodded her head and snapped her fingers in solidarity with de Asis’ words. 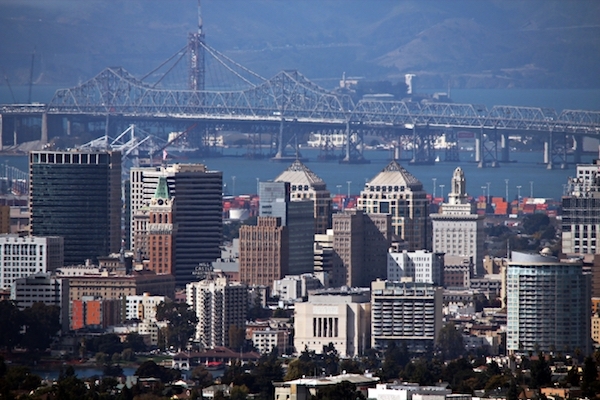 Kaplan added, “Oakland is a city that talks about how we value refugees. Well, these are our refugees … our economic refugees living on our streets.” Her memo stated that the vast majority—over 80 percent—of Oakland’s unhoused are from the city originally. 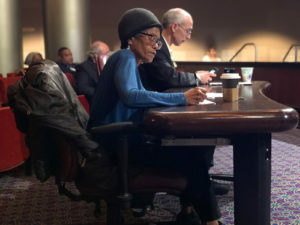 Pamela Davis, a 62-year-old Oakland resident who has lived in the city since she was 6, attended Monday’s meeting in hopes of understanding how to access low-income housing for seniors. She sat in the very front row, meticulously jotting down notes as each panelist spoke. “I am here so I can remain alert and stay involved,” she said. “Plus, I need to learn about these issues because now I feel the pressure of personally being affected,” she added, breathing a heavy sigh. She urged the city to use the land parcels it owns for the construction of affordable housing, rather than selling those spaces to private developers. The crowd cheered as she continued, “Can we please stop selling city lands? Can we please build low-income housing with what is left?” The clapping lingered well past her final questions. Kaplan segued into the meeting’s conclusion by reminding attendees of her proposed resolution, which includes taxing the owners of vacant properties to pressure them to build housing instead of letting the land sit vacant and setting up housing units on land owned by faith-based organizations, including churches. She also is proposing a “dedicated funding stream” that will be generated from the special parcel tax on vacant properties.The tax will be reserved exclusively for solutions to homelessness issues, and it will be placed on the November ballot. Kaplan called her plan not an economic proposal, but a moral proposal. “People who are buying properties and not putting them to use are undermining our society,” said Kaplan in regards to the vacant property tax. “There are more vacant properties than there are unsheltered residents. Think about that,” she said, before repeating herself for emphasis. The council will likely vote on her proposal in April.